This system was visited for the first time on EDSM by Leif_Erikson on May 27, 2017, 3:18:26 PM. 403 ships passed through Spoihaae XE-X d2-9 space, including 2 ships in the last 7 days. 1 ship passed through Spoihaae XE-X d2-9 space in the last 24 hours. Monde de la Mort (World of Death) is a small landable metal-rich world in extremely close orbit of a white dwarf. The world has an elliptical orbit which is 2.5 light-seconds at maximum and a terrifying 0.06 light-seconds at closest approach to the white dwarf. The orbit takes approximately one hour. Landing on this planet is extremely hazardous: The planet can only be approached when it is outside the exclusion zone for the white dwarf, and getting caught in the streams of the white dwarf is possible. Explorers trying to land have a narrow window in which landing is possible. Generated heat is also high and must be considered when landing. Finally, the planet will pass through the jets of white dwarf over the course of the one-hour orbit, potentially leading to entire ship destruction! 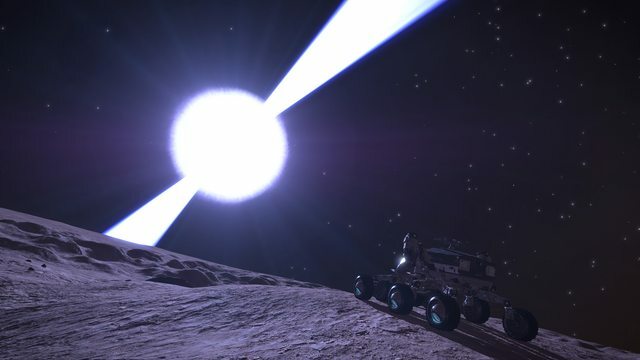 Those managing to land will see astonishing views of the white dwarf from close range.